Andrea Cucchi (Starboard / Point-7) has been competing on the PWA World Tour for over two decades having made his debut on the tour in 1997. 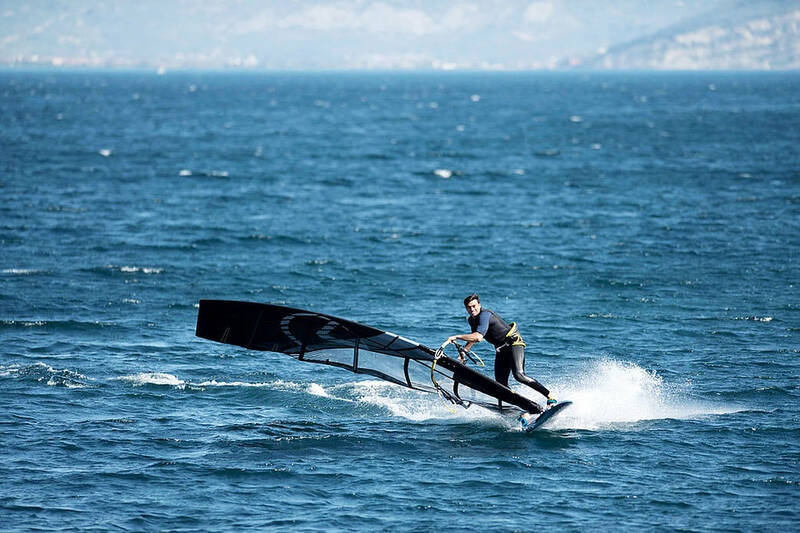 Over the years the Italian racing machine has earned numerous top results, both nationally and internationally, including being crowned Formula World Champion 5-times, recording several podiums and overall top 10 finishes on the PWA Slalom World Tour and winning the Defi Wind. The 43-year-old may not compete as much as he used to, but he continues to be a prominent figure in the world of windsurfing as the boss of the dark side of windsurfing - Point-7 Sails - and his hugely successful and continually evolving company has brought him some of his brightest moments on the tour. Not only having won finals on his own sails, but also watching several of his team riders and friends also taste victory on the World Tour - including helping Matteo Iachino (Starboard / Severne / Shamal Windsurfing) - to win his first world title in 2016. As one of the most knowledgeable guys in windsurfing and as the brains behind Point-7 we recently caught up with Andrea for the latest in our 20 Questions feature. 1. Why are you so passionate about windsurfing? I can think of many reasons. After a windsurfing session, the day is much nicer, and if I stay too long without it, I’m not as peaceful and relaxed as if I windsurf daily. It’s the whole lifestyle behind the sport, the people you meet, the traveling, the feeling that you get once you have the feet in the straps which makes you love this sport. It takes you to a healthy and real side of the world. There is so much around it, that it never becomes boring! 2. What quality do you like most in other people? I like positive and kind attitude. This is how I’ve also selected our Point-7 Black Team for 2019. 3. What annoys or frustrates you the most? No respect. Negativity. Slow reactions. 4. What do you most like in yourself? I always try to help. 5. What do you dislike in yourself? I don’t like to say no, but I should sometimes. 6. What has been your best moment on tour? I’ve been doing it for so long, that there were many good moments. The tour is a school of life, and it has brought a lot of positive moments and experiences. It’s not a 5-star comfort to travel the world how we do it, but it’s the best way to do it. The first victory of Point-7 across a finish line has been a great moment for me, even if it was not me riding that sail. I’ve won a couple of finals with my own sails, but I still prefer to see others doing it. 7. What has been your worst moment on tour? There are no worse moments in life or on tour. They are just experiences that you need to learn to handle. 8. Knowing what you know now, what advice would you have given yourself when your career started? Our sport has so many details to take care. You have also to manage everything by yourself, on a very limited budget, and advices are plenty to give and you could write a book. It’s the reason why most riders till they are at least 27-years-old, have a hard time to reach their best results. Experience is very important, patience is very important, working hard and listening and windsurfing next to more experienced riders is important. When you think you have free time, it means you are being lazy. There is always something to do. If we are given the possibility to try out to be the best windsurfers of the world, we have to take that chance and work on it. It’s not a hiding place for not doing another job, or having a windsurfing holiday sponsored by someone. 9. What is the best advice you have ever been given? Every advice is a great advice. Never stay home! A longer day to fit in more time to do what I do on daily basis. More time to do sports, more time for the family, more time for work and problem solving. 11. Do you have any superstitions? White cats… kidding, no I don’t. It’s up to us. 12. Which living person do you most admire? I admire everyone who knows how to be happy with themselves and are able to make people who surround them be comfortable. All the people around who make me feel good. 14. If you weren’t a professional windsurfer, what would you like to be? I like to keep busy and trying to do as best as I can with my skills. I’m now mixing professional windsurfing, with having my own sail brand, and this is what I chose and worked for all my life, and I’ve been lucky to have been given this opportunity. There are so many amazing jobs that can be done in this world, and the most important is to do them with love, passion and effort. 15. Where is the best place you’ve been? There are too many best places which are too different to say which is the best. I like it better if the people are friendly, the food is good and it’s comfortable to go windsurfing. I like to have the right mix. 16. Where would you most like to go to that you haven’t been to yet? I’m happy to travel the world, but also happy to spend time home. I’m ready for next windsurfing adventure as long as if I can share it with the right people. Just like last week at Defi Wind at Miyakojima. 17. Who would you most like to have as a dinner guest, dead or alive? Those friends I’ve made around the world, that feels like yesterday when you meet them after years. 18. First App you open in the morning? My home window to check if it’s windy… according to that, I than decide which app to start the day with. Priority is anyway outlook. Need to check that production is running smooth. 20. A phrase you live by?